The Korea Herald is publishing a series of articles highlighting South Korea’s promising startups in the emerging sectors of digital health care and next-generation medical devices. This is the 20th installment. - Ed. Parenthood involves many surprises and hardships, but for Joshua Han, the biggest challenge in raising his children was managing their atopic dermatitis, a skin condition that is common but has yet to find a permanent cure. Atopic dermatitis, also called atopic eczema, is a chronic condition, common among children aged under 5, in which the skin becomes inflamed, itchy, cracked and rough. Though the symptoms are hard to completely heal, their severity can be improved with careful daily treatment routines. Over the years, Han always hoped for a scientific way to help parents and doctors address and treat this condition. And now, he has brought his vision into reality with a high-tech tool that can do just that. Meet GPSkin Barrier -- a handheld medical device aimed at helping patients with atopic dermatitis and sensitive skin engage in better skin management routines. It was developed by local startup Gpower, founded and led by Han, who has more than 20 years of experience in semiconductor technology. The product is equipped with sensors that measure two biomarkers critical to managing atopic dermatitis: skin barrier (transepidermal water loss, or TEWL) and skin hydration level (stratum corneum hydration, or SCH). The data is transferred to an app, which gives an immediate diagnosis and treatment guidance. “We combined our strengths in biosensor design with the internet of things technology to build a skin care device that can help atopic dermatitis patients,” Gpower founder and CEO Han said in a recent interview with The Korea Herald in Seoul. The check-up process is simple. 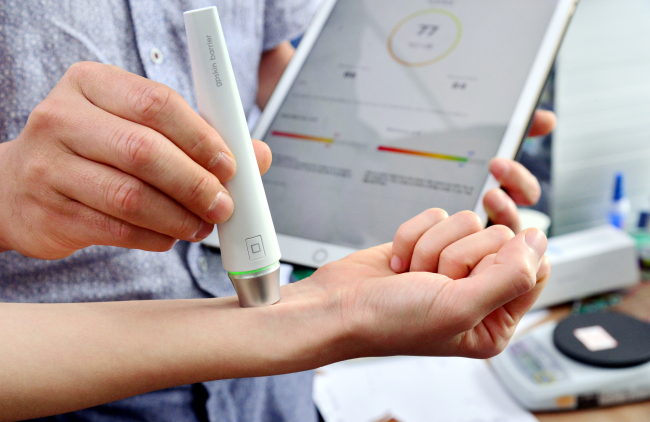 Point the pen-shaped device at any part of the skin -- presumably an area with a severe rash -- and hold still for a few seconds to receive an instant evaluation via an app on a smartphone or tablet. The TEWL marker ranges among “strong,” “normal,” “dry,” “weak,” “damaged” and “inflamed.” SCH is represented by a percentage indicating moisture level. The results are accompanied by treatment tips including washing methods, moisturizing, dietary habits and more. The startup’s device boasts a diagnostic accuracy similar to existing professional skin diagnostics machines. However, it is priced at just 250,000 won ($224) per unit, more than one-hundredth the cost of skin diagnostics systems currently used by hospitals. The technology is commendable, and the pricing is adequate. But most importantly, does using the device actually help patients see real, tangible improvements in skin health? A joint clinical study with Seoul Medical Center on 25 adult patients with atopic dermatitis showed that after using Gpower’s device, patients reported a 29 percent decrease in the severity of their symptoms and a 56 percent decrease in steroid usage. “After following the recommended action and witnessing visible improvements in skin health, patients were more motivated to sufficiently moisturize and adopt better lifestyle habits. They are also able to figure out which products work or don’t work for them,” said the CEO. “It’s kind of like how regularly weighing yourself while on a diet can motivate you to stay on the regimen, because you can track the progress via changes in your weight loss,” Han said. As of now, Gpower’s device has been sold primarily to hospitals and research institutions -- such as Oregon Health & Science University and Stanford School of Medicine, to name a few -- as a tool to monitor and log a patient’s skin condition on a daily basis during clinical trials. The Seoul-based startup has also managed to bag a number of major corporate clients with interest in skin care, including Dr.Ci:Labo, a Japanese medical skin care brand under Johnson & Johnson, as well as several global cosmetics firms whose names cannot be disclosed due to contract terms. While such achievements have been meaningful, the startup’s main business interest lies elsewhere -- breaking into and grabbing a share of the US teledermatology market, according to Han. Teledermatology, a subfield of telemedicine, essentially refers to dermatology examinations, diagnosis and treatment delivered to patients remotely via digital technologies. Gpower is currently working to get the GPSkin Barrier system certified by the US Food and Drug Administration, and to bring its device into the US teledermatology market in partnership with local hospitals.